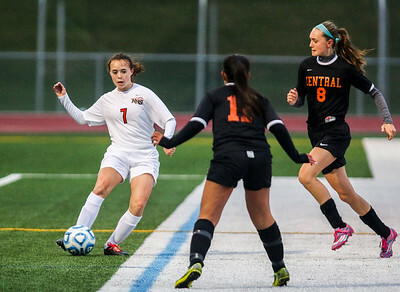 Sarah Nader- snader@shawmedia.com Crystal Lake Central's Madelyn Hollander (left) and Huntley's Brenna Keegan head the ball during the first half of Tuesday's in Huntley April 5, 2016. Huntley defeated Central, 4-0. 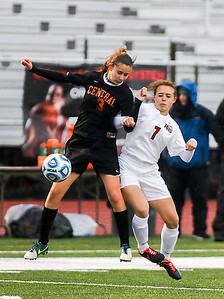 Sarah Nader- snader@shawmedia.com Huntley's Brianna Wilder heads the ball during the first half of Tuesday's game against Crystal Lake Central in Huntley April 5, 2016. Huntley defeated Central, 4-0. 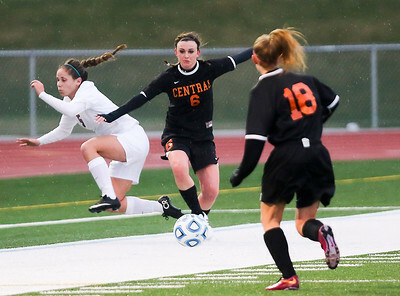 Sarah Nader- snader@shawmedia.com Crystal Lake Central's Mikayla Bertalon (left) and Huntley's Brenna Keegan stop the ball during the first half of Tuesday's game in Huntley April 5, 2016. Huntley defeated Central, 4-0. 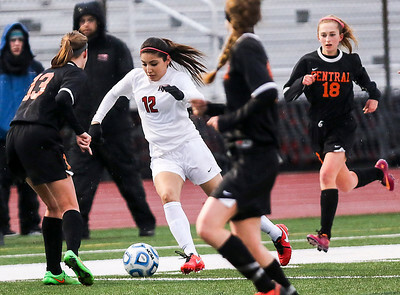 Sarah Nader- snader@shawmedia.com Huntley's Yulissa Solis (center) dribbles towards the goal during the first half of Tuesday's game against Crystal Lake Central in Huntley April 5, 2016. Huntley defeated Central, 4-0. 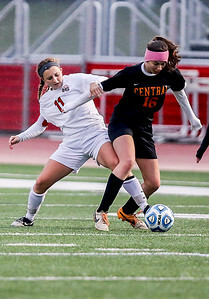 Sarah Nader- snader@shawmedia.com Huntley's Brenna Keegan (left) kicks the ball towards the goal during the first half of Tuesday's game against Crystal Lake Central in Huntley April 5, 2016. Huntley defeated Central, 4-0. 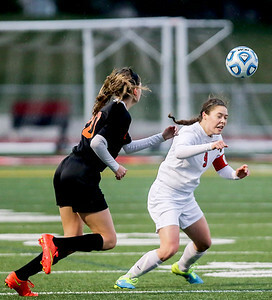 Sarah Nader- snader@shawmedia.com Huntley's Taryn Jakubowski (left) and Crystal Lake Central's Alexandra Scarfe fight for control of the ball during the first half of Tuesday's game in Huntley April 5, 2016. Huntley defeated Central, 4-0. 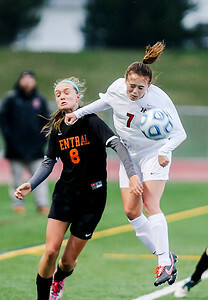 Sarah Nader- snader@shawmedia.com Huntley's Erin Gaitsch (left) is pushed out of the way by Crystal Lake Central's Shannon Widdowson during the first half of Tuesday's game in Huntley April 5, 2016. Huntley defeated Central, 4-0. Huntley's Brianna Wilder heads the ball during the first half of Tuesday's game against Crystal Lake Central in Huntley April 5, 2016. Huntley defeated Central, 4-0.